Missouri Fox Trotting Horse Breed Association » Missouri’s Charming April M.
Home Education Missouri’s Charming April M.
Missouri’s Charming April M. was born to be a champion. This was due to the three way winning combination that I feel was in her favor. I feel that Charming April is out of one of the best mares in the breed, Bo’s April Charm. Her sire, Missouri Traveler E. is the most widely known and dominate stallion in the breed today. Also April was ridden by the best trainer, my husband, Jerry. Jerry started April’s career by winning the Three Year Old Futurity tying first on all three judges cards. 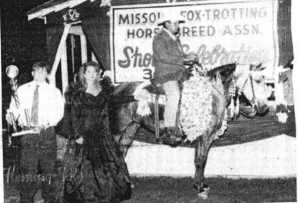 Jerry and April went on to win the Three Year Old Mid­ America Stake Class. They wrapped up the 1991 show season by winning the Three Year Old World Champion Mare Class and then by winning the Three Year Old World Grand Champion Stake Class. This ended her 1991 show season undefeated. Charming April met the challenges of the following show season with much success. This time, I started April’s 1992 season at Mid-America by winning the Ladies Four year old Mare Class-and came back to win the Ladies Championship Stake Class. Jerry concluded her season by winning the Four Year Old Mare Class with an uncontested win, with three straight firsts. Then Jerry and April came back Saturday night to win the Four Year Old World Grand Championship Class with a unanimous decision receiving a first place vote from all three judges. We always ask the question, “Is the bloodline as important as they say?” People spend hours and hours debating this issue. Over the past 25 years, Middleton Stables have prided themselves in matching the perfect stallion and mare combination to produce world champions. Also, when our customers bring a mare to Jerry and Geno they spent valuable time studying the mare’s papers to find the best combination for their mare to match with our stallions. We are looking forward to Charming April’s 1993 show season. Jerry and I are both planning to show her this year. Charming April will be a top contender for the most prestigious title in the breed, the World Grand Championship. 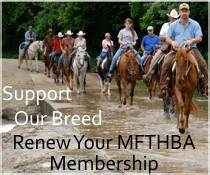 We have appreciated your support in the past and hope for your continued support in the future.